I’m not sure if you have noticed, but we are crazy for smoking here at the Cafe. We regularly have available smoked brisket, smoked pork shoulder (which becomes BBQ pulled pork), smoked trout, smoked chicken salad – all smoked in house with local meat by yours truly and mr. zeng. We have been doing this for over six months now (not without our pitfalls) and we are getting quite good, if I don’t say so myself…Our meats are lovingly rubbed and smoked till they are moist and full of tons of flavor! We use a small electric smoker, a big giant beast of a smoker, and a medium sized charcoal smoker that was the original smoker of Iron Barley‘s Tom Coghill – St. Louis’ master smoker himself. and at brunch enjoy our Smoked Trout Bagel. Last year I was chosen to participate in companion breads “collaBREADtive” project. Our time is coming soon – starting monday we will be serving “the best BLT” with companion’s whole wheat chive ciabattini – local bacon, local tomato, local greens, and house made pesto aioli! we will also be selling the signature bread at the grocery, so you can try your hand at the best BTL, too. Come by and try it, we are only selling it for a little over a month. i have been waiting months and months for this. all those times i almost broke down and bought asparagus from argentina – totally worth the wait. at the onset of this season i am reminded of one important thing – fresh food lasts so long in my fridge. i first learned this lesson as a line cook in baltimore – working at Ixia (r.i.p. 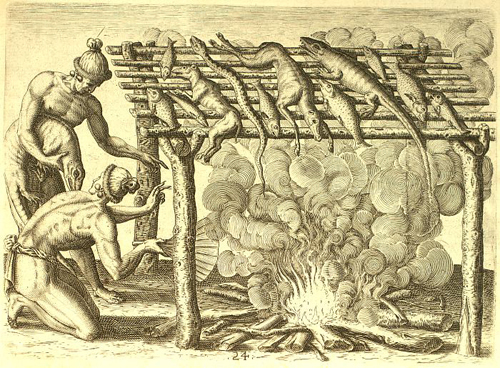 ), we used to get produce from a local farm. one weekend i got beautiful purple asparagus for a special. at the end of saturday night i stuck what was left in a pan and shoved it in the back of my station, without thinking. i found it again and two weeks later it was still as firm and beautiful as when we first received it. this week at Local Harvest we received lovely greens, beautiful radishes, bright red strawberries and eye-popping early turnips. all of which look as great as they did the day they were plucked from the ground. i can’t say enough about those turnips (from three rivers community farm in elsah, il) – the greens and the roots were so crispy and full of flavor. speaking of fresh, i recently viewed a great movie at the white flag projects…called FRESH. i would say i spend a lot of time reading and watching all about the ‘new food movement’ – but this is the first film that has been inspirational. not picture after picture of sad animals- a thing we DESPERATELY need. i was growing weary of the depressing and apocalyptic messages of the food community – telling us that we are killing ourselves and out environment (which i completely agree with!) – finally Ana Sofia Joanes is out there showing us that it is not all lost and that good food is not just for the elite. Until two weeks ago, I had never visited a full blown hog farm. I’d seen a few pigs at smaller farms, and had friends with pot-bellied pigs, but hogs, hogs, everywhere was certainly new to me. We started carrying Geisert breakfast sausages, links, brats and bacon in March. 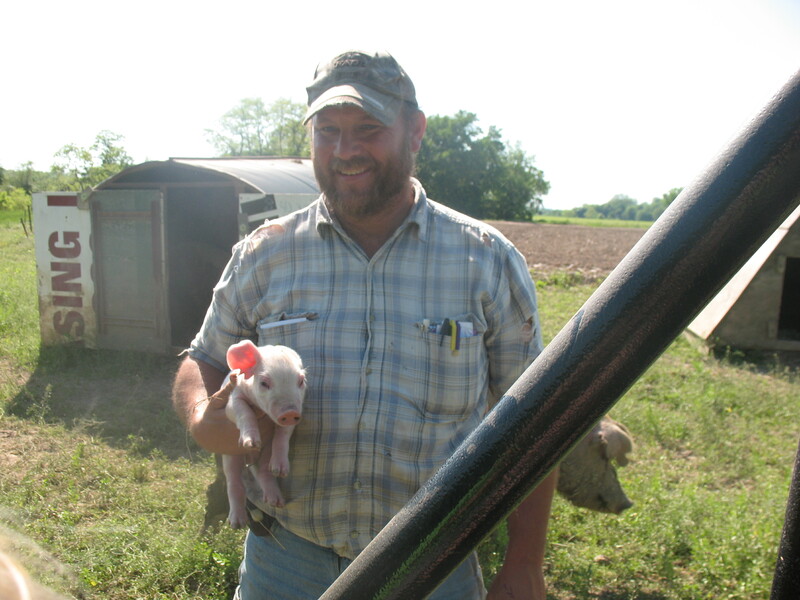 Todd Geisert, the owner of the farm, told us about his family hog farm, the open fields where he raises his hogs, the sustainable methods he uses and a little about the history. So, on a beautiful May day I set out with my son in tow to see for myself. The farm, located in Washington, MO, is easy to find. you turn And the old timey produce stand in front is a clue that you are not in a big city. There is also a small upright cooler to the side of the stand stocked with Todd’s brats, sausages, pork burgers and even ham sausage. All the products are for sale on an honor system. This is true even at the height of produce season when the stand is overflowing with tomatoes, squash, and peppers. Todd says it’s worked out great and so far he’s never had a problem. The farm has been in the family since 1878. His mom and dad live across the street from the farm in a house built in the late 1800’s. You wouldn’t know it from the outside because his folks have recently add an addition and done a lot of work to this beautiful home that overlooks the Missouri river. I was able to meet his mom and she quickly charmed my three-year old with some crackers, apple juice, and a friendly grandma demeanor. Todd drove us around the farm in an open aired jeep. He has another farm nearby where he keeps more hogs–in total he said he keeps about 1000 hogs. This is large for a farm like his and proof that you can raise a large group of animals without confinement. 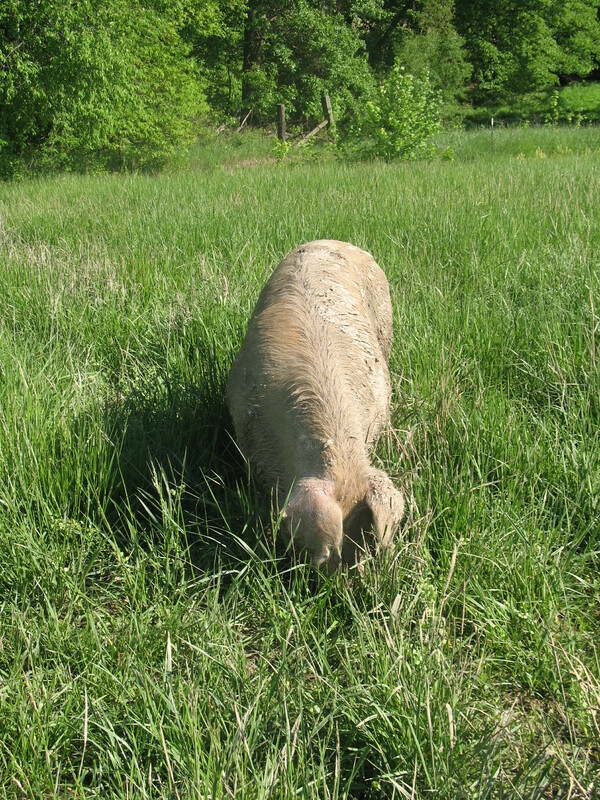 Watching the pigs graze on the hillside and wallow in the mud I was reminded of Joel Salatin’s quote in Food, Inc about the “pigness of the pig.” It seems Todd’s hogs get to express that everyday. 5. 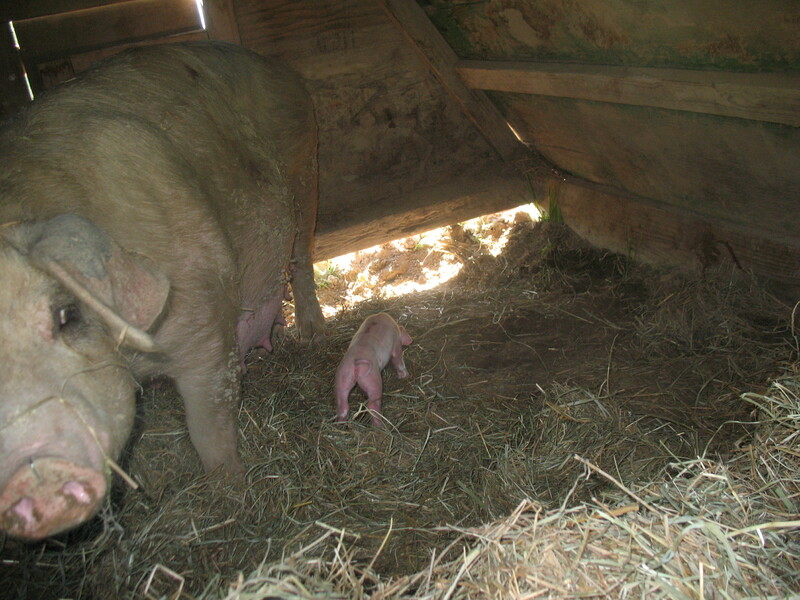 With the exception of hogs that are kept for breeding, the life of each hog is about six months. 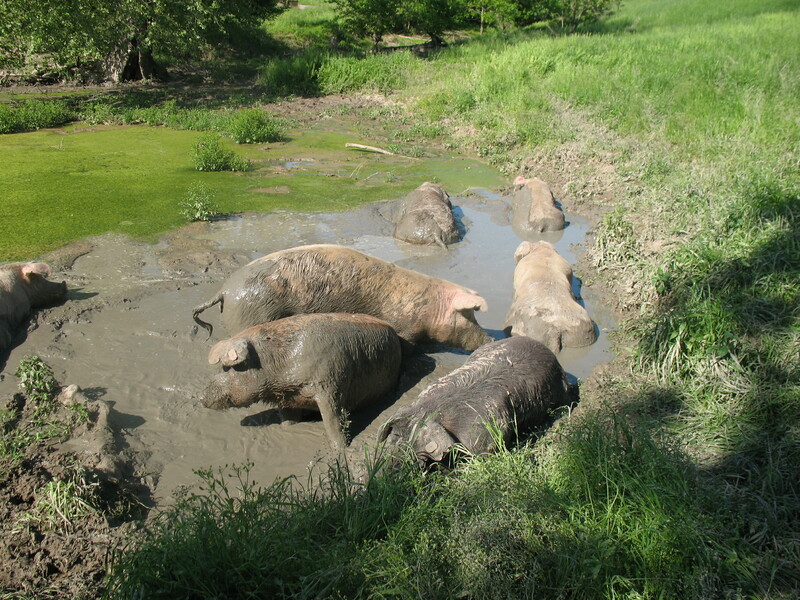 Hogs relaxing in the mud. Mama pig in labor. She had five more piglets that evening.